Here's another wonderful companion to the Studio Ghibli films. 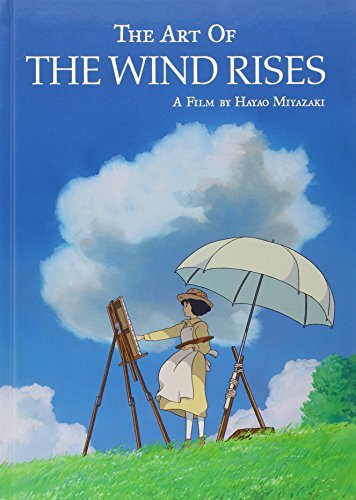 The Wind Rises happens to be last film that Hayao Miyazaki has directed. So maybe this is going to be the last artbook you'll see with Miyazaki's concept art for animated films. The art featured are the character and background sketches, background art, plane designs and screenshots from the film. Presentation is just like any of the earlier Studio Ghibli film artbooks. The artworks come with captions by the staff to provide background to the story and art. Some sections look at the production process, from how the concept sketches are turned into animation. I enjoy looking at the scenery, the composition and marvel at how well the mood is captured. The background paintings and those of the interiors are so convincing and inviting. All concept sketches and machine designs are by Hayao Miyazaki. Concept art and backgrounds by art staff are supervised by art director Yoji Takeshige, and character design is by supervising animator Kitaro Kosaka. There are interviews with Yoji Takeshige, colour designer Michiyo Yasuda and director of digital imaging Atsushi Okui. The setting is in rural Japan and as usual you'll see a lot of traditional Japanese houses, and later towns, and the background are in similar style to other animated films that feature this era. The artworks are beautiful and in the highest standards as you would expect from Japanese animation. Compared to other Studio Ghibli films, there's no fantasy elements in this film. So the artworks are really more on the human characters and settings. Right at the back is the complete English script. Recommended to fans of Studio Ghibli and Hayao Miyazaki.